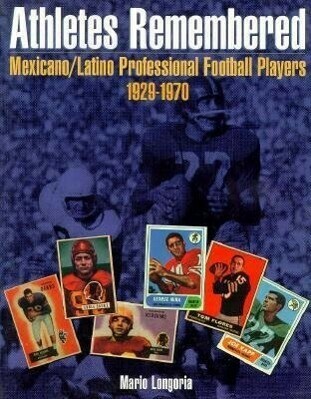 In the first guide ever written about Hispanic professional football players, Mario Longoria profiles all the important Mexicano/Latino athletes, providing valuable biographical information and photographs as well as a lively account of the career highlights of each player. The author recaptures the excitement of play-by-play descriptions of crucial games in which these Latino gridiron heroes played central roles. In addition, he provides a summary of Hispanic players' contributions in college all-star and bowl games and comprehensive lists of Hispanic players drafted by pro teams and those who appeared on pro football rosters.Longoria worked closely with the players, coaches, managers, and public relations directors of NFL teams to compile the information in this book. A much-needed addition to sports history, Athletes Remembered saves these unsung heroes from undeserved obscurity. Mario Longoria lives in San Antonio, Texas.